For the use in cows over 100kg and over 5 weeks old. 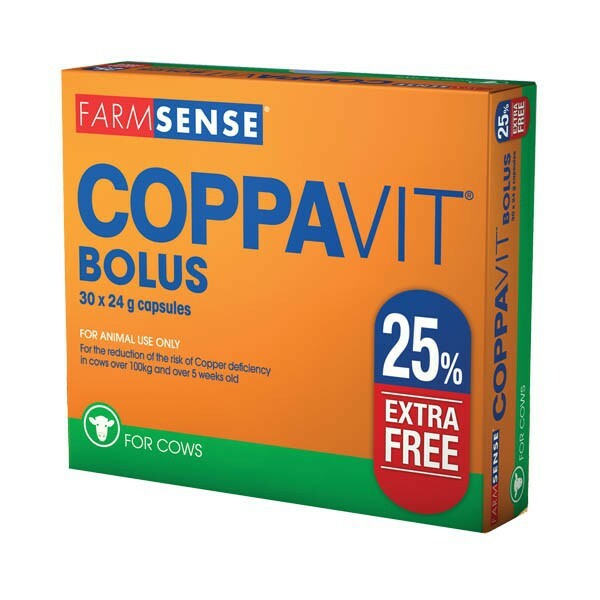 Coppavit Bolus provides a sustained release of copper suitable for growing cattle or breeding cows being fed a grass or forage based diet. In areas where soil or forage is low in copper, Coppavit Bolus provides the daily recommended requirement of copper for an extended period of 180 days, giving you peace of mind for 6 months after administration. Coppavit Bolus makes a perfect companion for spring turnout, when moving from a forage based, winter diet to fresh grass. Cattle being fed forage high in copper antagonists such as zinc, manganese, sulphur or molybdenum will also benefit from the long term supplementation that Coppavit Bolus offers. Cow mineral boluses such as Coppavit bolus are highly cost effective and easy to use. However if choosing not to use boluses, why not try a copper containing mineral drench such as our Coppavit drench. © Farmsense Ltd. All rights reserved. | Farmsense is part of the Tangerine Group of companies.